I started this blog because the more I learned about the personal finance industry, the more I saw the same problems that are pervasive in my other line of work in the travel hacking community: people are either paid to lie, or too ignorant to know if what they’re saying is true or not. So, I figured I’d start a blog where I could tell people the truth. One difference between personal finance and travel hacking is that personal finance has an unusual number of people who are not being paid to lie, but for one reason or another are also incapable of telling the truth. I started thinking about this last week while researching some recent Wall Street Journal columns by Jason Zweig. At least as early as February, he started writing about the fact that by shopping around you could earn more interest on your savings that the rate offered by the big national banks and on mutual fund settlement accounts offered by brokerage houses. This is true. Federal Money Market (VMFXX), yielding 2.34% as of March 19, 2019. Prime Money Market (VMMXX), yielding 2.45% as of March 19, 2019. What is the point of describing this situation as a “range” between yields on Vanguard money-market funds? If you are saving cash in a Vanguard account, and can meet the $3,000 minimum investment requirement, you should put it in the Prime Money Market fund. If not, you can use the Federal Money Market fund (which is also the settlement account for Vanguard brokerage accounts, so it’s not like you have a choice). If your current brokerage offers less than that on your cash, you should move your cash to Vanguard. Again this at first appears to rhyme with advice. Why would he mention Marcus if he isn’t advising readers to use Marcus? But 2.25% isn’t the highest interest rate you can earn on an online account: All America Bank offers 2.5% on up to $50,000 in their Mega Money Market Checking accounts! Let’s turn from the Wall Street Journal to that other bastion of financial erudition, Bloomberg Opinion. Barry Ritholtz, the namesake of extremely-online financial advisory Ritholtz Wealth Management, last week expressed his anxiety over the extremely poor protections enshrined in law for participants in retirement plans offered by non-profit organizations and state and local governments, so-called 403(b) plans (which I’ve had occasion to write about before). “If an employer and 401(k) plan sponsor put a high-cost, tax-deferred annuity into a tax deferred 401(k), they would be warned by counsel to expect litigation. But why should it be that people are left guessing in the first place? This is the fundamental pattern I see over and over again in the world of personal finance. Take, for example, my favorite resource for mostly-up-to-date interest rate information, DepositAccounts. 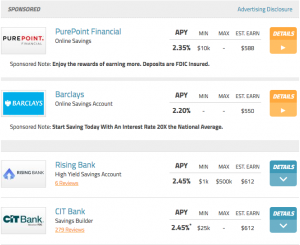 This is an excellent resource I use constantly to check on interest rates on rewards checking accounts, online savings accounts, CD’s, and money market accounts. Go ahead and bookmark it, if you haven’t already. Now, this is obviously absurd: why would anyone prefer an account with a $10,000 minimum paying 2.35% over an account with a $1,000 minimum paying 2.45%? But DepositAccounts found a couple banks willing to pay them for preferred placement, presumably because those banks, rightly or wrongly, calculated that preferred placement would attract deposits in excess of their account’s objective appeal. It would be awfully odd to end a post like this without offering some concrete advice. Indeed, I’d be guilty of exactly what I accused Ritholtz of: educating without advising. When you are reading a piece of financial journalism, pay close attention to what is not being said. If someone says you “can” increase the interest rate on your savings, or you “can” reduce the expenses you pay on your investments, check whether they also say you “should” increase the interest rate on your savings, or you “should” save money on management expenses. If not, why not? Does the publication have relationships with investment managers they don’t want to jeopardize? When you’re reading a source of information like DepositAccounts, the same rule applies. If a particular account is “sponsored,” or a partner is “preferred,” or a bank is “recommended,” are you given any reason why that account is superior to any other account? Are there other, better accounts that are excluded because they are unwilling to pay for placement, or don’t pay a commission to the site? I’ve written elsewhere that many people make a grave mistake when compensating for conflicts of interest. They think, “now that I’m aware of the conflict of interest, I’ll discount it by an appropriate amount.” But this is incorrect. The correct response to a conflict of interest is to discount the advice given by 100%. If possible, you should even discount conflicted advice by slightly more than 100% (this is not always possible, for example in insurance sales where some kind of commission is typically unavoidable). The United States has some of the most vigorous protections for free speech in the world. It also has some of the most strict restrictions on professional speech, and a national media almost entirely in the control of a few powerful corporations and individuals. This curious contradiction often makes it difficult or impossible to know whose voice you’re hearing at any one time: when is Jason Zweig speaking for Jason Zweig, when is he speaking for the Wall Street Journal, and when is his voice filtered through the Journal’s legal department? But it is still possible, and necessary, to figure out when, for whatever reason, you’re not getting the whole story and to try to put the pieces together for yourself. Well, always. Every time he hits Submit. As someone who’s trying to make a living as a freelance writer, I could tell you a story or two about ridiculous things Legal kills on a daily basis. I would presume it gets even tougher when a journalist is trying to act as an adviser. Then again: hard to blame them in a society where you can sue a hamburger for hurting your feelings. Which is why you tip is right on the money: Look for what’s NOT being said.